As this new school year gets underway, one big question that parents, teachers, and administrators ask themselves is how much and what approach to phonics should be taught to kindergarten children. I would answer them with this question: What better way is there to interest a 5 year old in letters, sounds and words than starting with his/her own name? All of us learn best when we can build on our past knowledge or our schema. Just about all children have a special connection to their own name and that interest gives us a perfect starting place for teaching about the letter-sound connection. That is a basic premise behind what is sometimes referred to as “Star Name” activities. With a bow to Patricia Cunningham whose writing introduced me to this name study and to my former colleagues at P.S. 321 in Brooklyn who were always coming up with new ways of extending this activity, I would like to share this intellectually challenging and fun name study with you. ∗ Write each child’s first name on a piece of sentence strip that is just about the size of the name. Use longer strips for long names and shorter strips for short names. This helps children notice the connection between the way a long name like Abraham looks and sounds compared with the way a short name like Ann looks and sounds. ∗ The child picked is the “Star Child” for the day. ∗ The “Star Child” sat in a ‘seat of honor’ and the children interviewed him/her. Some teachers let the class decide on three questions to ask at each interview. For example: Do you have any brother or sisters? What is your favorite color? Do you have any pets? The teacher records each interview on chart paper. This can be copied into a class “Star Name Big Book” with the child’s picture on the interview page. Children and parents love reading and rereading this book .It makes for a perfect shared reading experience because of the repetition of questions. ∗ Write the child’s name again on a large piece of paper, saying each letter as you write it. Together with the children, discuss observations. You might talk about upper and lower case letters, count how many letters are in the name, notice repeating letters, notice the size of the name, etc. ∗ Here’s a fun letter-scramble game to play after you discuss what children have noticed about the name. Cut out each letter or have pre-written letters on large index cards. Call on children to “be” the letters. Tape a letter on the front of each child’s shirt or let them children hold the letters in front of themselves. Mix them up. Have children come up and put the name back in the correct order. Sometimes it is less intimidating and more risk free if children volunteer to do this in pairs so that they can help each other. The “star child” can be the name checker! 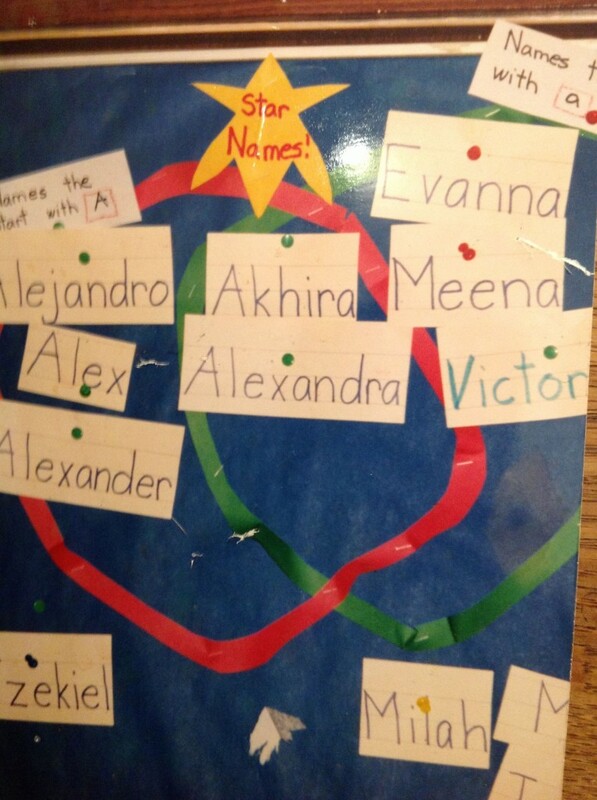 ∗ Be sure to reserve a bulletin board for your Star Name display. Tack the child’s name strip onto it. Each day you will be adding a new name to this display. ∗ Culminate each star name session with each child writing the star name on one side of a drawing paper with crayon and then drawing a picture of the star name child under it (or a picture of something they enjoy doing with the Star Name child, perhaps playing in the schoolyard or building with blocks together.) They then write their own name on the back of the paper. All the pictures can be stapled together with a pretty cover made by the star name child and taken home by the star name child as a class gift to be shared with families. ∗ Here is a suggestion from a P.S. 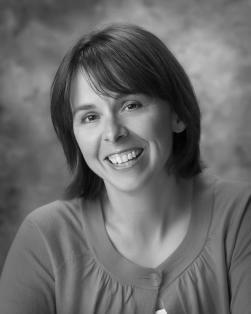 321 teacher, Glenda Lawrence. Draw a frame on the white board/ chalkboard or tape a frame on a magnetic board and jumble up all of the magnetic letters in one of the names that have been studied. Challenge children to put the name back in order. It’s informative to see what strategies children use to “decode” the name. Does a child understand that the capital letter begins the name and then does he use this information to check with a posted class list of names? Does he count the number of letters in the name and check a class list to see what names have that amount of letters? Be sure to have a large class name list nearby. Encourage children to share their strategies and you begin writing these straregies on chart paper. Refer to these periodically. Children will probably be coming up with new strategies as the study continues and you will add them to the chart, always rereading the list of strategies. Each day, pick a new name out of the box and follow the same routines. As you accumulate more “Star Names”, you can lead the children towards making more complex observations. ∗ Both Gina and Gail have names that begin with a “G” but the “G” makes a different sound in each name. ∗ Alexandra’s name begins with an A and ends with an a but one is uppercase and one is lowercase. ∗ Lee has the shortest name in the class. It has only 3 letters. ∗ We can think of lots of words that rhyme with Jan’s name – man, pan, can, fan… ∗ You can rearrange the names on the Star Name bulletin board into groups according to some common attribute (e.g. number of letters, syllables, etc.) and let the children “guess the rule”. After doing this a few times, children can have turns to organize names according to their rule. ∗ Play, “I’m thinking of…” as in “I’m thinking of a girl whose name begins with the letter S, ends with h and she has two a’s in her name. It’s a 5-letter name. Can you guess who she is? ∗ Play “construct a person”. (A version of hangman!) where the teacher puts lines for each letter in a name and children have to guess if a particular letter is in the name. If it is, then the correct blank is replaced with that letter. If it isn’t, then a part of the person is drawn. The goal is for the class to figure out the name before the person is completed. The activities are endless. You will no doubt think of many more, as will your children. If you have done a name study with your class and you have other strategies that you have used, please do share them. We can all learn for each other! This entry was posted in Investigating Choice Time: Inquiry, Exploration, and Play and tagged hangman game, name study, Patricia Cunningham, phonics, star name, Venn diagram on August 31, 2014 by Renee.